Providing excellent customer experience is critical to maintaining customer loyalty and growth, especially for banks. However, like many companies, this community bank was relying on anecdotal information to evaluate customer experience. Branch management used mystery shoppers and their own informal assessments, but they had no formal metrics or other means to quantify their customers’ experiences across channels. The bank recognized that only by measuring experience could they accurately gauge and improve it. And they needed hard data to identify customer needs at the branch, product, and people levels. 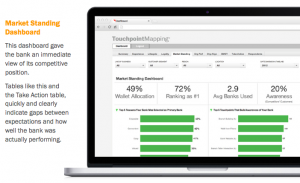 We built the bank’s Touchpoint Mapping dashboard around the brand, touchpoints, customer segments, and branch data unique to the bank, reflecting industry standards and attributes that make this institution special. Within a few weeks, the bank was getting a clear picture of their customer experience, and the metrics highlighted both threats and opportunities. Surveying customers on applicable attributes, relevant loyalty drivers, known competition, and real customer lifecycles, opens the door to rich information-gathering that easily surpasses ad hoc assessments. Review profile data on individual customers who responded to surveys. Particularly relevant for this bank was the ability to measure and compare individual branch experience. Touchpoint Mapping® helped executive leadership align its perception of customer experience with reality. It also gave the marketing team two immediate goals: boost awareness and share-of-wallet. Despite high marks on overall experience, the engagement revealed perception gaps and competitor vulnerabilities that needed immediate attention. The bank had overestimated the customer experience at new branches by equating top-line revenue growth with a positive experience. The bank’s perception of brand attributes like convenience and competitive rates and fees didn’t match those of customers. Competitors held a major advantage in mobile banking capabilities, while the bank had overinvested in web experiences that weren’t important to customers (e.g., chat, calculators). Employees and customers ranked the importance and effectiveness of static touchpoints such as radio and magazine ads very differently, revealing a misallocation of media spend. Customers banked with 2.9 banks on average, giving this bank less than half their wallet share. Only 20% of competitors’ customers were aware this bank existed. And previously unknown competitors, including a local credit union, were revealed. The bank’s awareness efforts underperformed across the board, with negative gaps around the web site, online search functions, social media, and direct marketing touchpoints. In the short term, this Touchpoint Mapping engagement articulated a clear-cut action list of key initiatives to close gaps, re-allocate budgets, and increase customer wallet share. And with McorpCX’s guidance and process, the bank was able to see the benefits of a disciplined approach to information-gathering. For the long term, we recommended they continue to collect customer feedback, measure status, progress, and improvements over time, in order to align business strategy to segmented customer wants and needs, and make well-informed business decisions. As a result of this engagement, the bank was able to connect the dots between actual customer experience, offerings, messaging, and process. They re-allocated budgets and attention towards the experiences most important— and most disappointing—to customers, like mobile and online banking. With real intelligence on brand, perception, and performance gaps, they were able to redesign failing processes and products to better meet customer expectations. And perhaps most important going forward, they experienced the benefits of a disciplined approach to Touchpoint Mapping first-hand, and now have the training and tools to continue the work themselves.